Former professional is serving a four-year prison sentence. How can someone have the desire and talent to compete at the highest levels of disc golf, and then not even play a one-day C-tier tournament? In “Where Are They Now?” Ultiworld Disc Golf staff writer Robert Leonard seeks to find out, as he looks at players who once toured, had success, or made a splash in the disc golf world and now don’t even compete at a local level. Editor’s note: The author of this article is the chair of the PDGA’s discipline committee. With the Professional Disc Golf Association National Tour residing on the West Coast for a few weeks, one name you won’t find on any of the tournament registration lists is Josh Anthon. For someone who lives in California and has won more than $100,000 in his career, this is quite the shocker. The reason for him not competing at these events, though, is as simple as it is sad. On November 5, 2013, Anthon was involved in an incident that resulted in the death of 55-year-old Michael Anderson. According to Sacramento news station KCRA, witnesses described an argument between Anderson and the occupants of a recreational vehicle, the driver of which turned out to be Anthon. After striking Anderson with the RV, Anthon left the scene, and a manhunt ensued that saw the former Innova Discs-sponsored player’s face plastered on television screens throughout the Sacramento area. Two days later, he turned himself in and faced second degree murder charges. Anthon eventually pleaded no contest – which accepts punishment but does not admit guilt – to lesser charges and was sentenced to four years in a California state penitentiary, followed by three years of probation. Now in the second year of his sentence at Folsom State Prison, Anthon returned a correspondence from Ultiworld Disc Golf, and the story he shares is one of reflection and rehabilitation. Regardless of your opinion on the situation and on the player personally, there is one thing no one can dispute: Anthon is an amazingly talented disc golfer. After being introduced to disc golf by his dad around the age of 8, it did not take Anthon long to realize that he had some serious talent for the sport. Anthon turned professional in 2001 and quickly won his first A-Tier tournament, the St. Patrick’s Day Open in Orangevale, California, in 2002. He would go on to amass 40 career victories, including 10 A-Tiers; four National Tour events; and a major, the 2007 World Doubles Championships with partner and good friend Steve Rico. He ended up with a sponsorship from Innova and was one of the core players that stuck with the brand when many players shifted their affiliations to Prodigy Disc in early 2013. His allegiance was something of which Innova team manager Jonathan Poole was very proud. Anthon was always a threat to win anywhere he played. While he is one of the many players that never broke through and won a world championship or a United States Disc Golf Championship, he was always in the hunt. Case in point: In 2009, Anthon was the first player to ever shoot below 54 at the USDGC’s Winthrop University Gold Course, and he has never finished worse than 18th place in nine USDGC appearances. From 2009-2011, he finished second at three consecutive PDGA Pro World Championships. That round came just three months after another memorable disc golf experience with Jenkins. After shooting a first round 63 at the 2009 Pro Worlds, which found him ten strokes off Jenkins’ lead, Anthon charged back and tied Jenkins at the completion of the final 9. On the fifth hole of their playoff, Anthon yanked his tee shot right, missed a jump putt, and held his hands to his face in frustration. Jenkins then made his putt to claim his first world title. While being on the cusp of a world championship and coming up short was a tough pill to swallow, time removed from the event has given Anthon an appreciation of his performance. Those career highs, though, are balanced out by a more infamous mark, as Anthon continued to play – and play well, no less – in PDGA events while he awaited trial after his arrest. It was during this time, from June to October of 2014, that he attained one of the most dubious distinctions in disc golf’s history: undefeated while on bail. Five wins, including three A-Tier victories, catapulted him back to the top of the sport and saw his PDGA rating reach 1043. If he were still a PDGA member in good standing – his membership expired at the end of 2014, and he has yet to receive formal discipline from the sport’s governing body – that mark would put him as the third highest-rated player in the world. If there is one thing that prison has done for Anthon, it has certainly changed his perspective. Once frustrated with three consecutive runner-up finishes at Worlds, he’s now proud. Once a high school drop-out, he’s now educated. To fill his time in prison, Anthon has chosen to better himself to, as he says, “take care of my family,” which includes wife Amanda and son Noah. Since entering Folsom on January 22, 2015, Anthon has completed his General Education Degree, while also attaining 13 welding certificates and working on another. He will be entering college in August. Anthon has also become a Christian and said he gives all of the credit for the second chance he will receive on his release date to the Lord. He also plays catch and ultimate with fellow inmates. While seeing Anthon turn his life around may make this sound like a redemption story, it is difficult to forget about the incident that started this entire process. When asked if he wanted to talk about the charges and his subsequent plea deal, Anthon only responded “maybe later.” His wife, Amanda, also declined to comment, stating that she had been advised not to discuss details of the case. 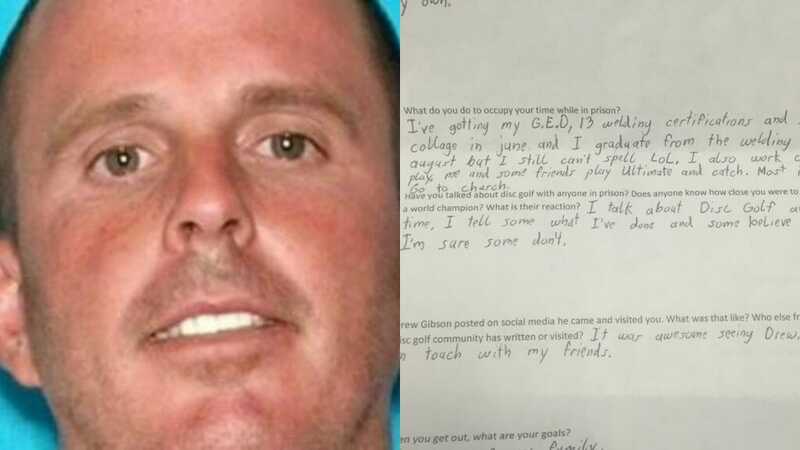 Fellow Sacramento-area native and touring professional Drew Gibson has remained in contact with Anthon throughout the duration of his legal ordeal. He talks to Anthon weekly and went to Folsom to see him in person. Ask any prison official or correctional official the purpose of prison, and the consistent word you will hear is not punishment, but rather rehabilitation. Incarceration is meant to make someone better than they were when they entered and to allow them to contribute to society upon release. Gibson feels that Anthon is accomplishing that end. Education, religion, and friends vouching for change are three positive steps once Anthon leaves Folsom prison. Will he ever set foot on a disc golf course again? And, from the viewpoint of the sport’s governing body, he will be allowed to renew his membership. Robert Leonard has been playing disc golf since 1993 and is currently sponsored by Discraft. Along with being the PDGA State Coordinator for North Carolina, he was awarded the 2014 PDGA Volunteer of the Year. 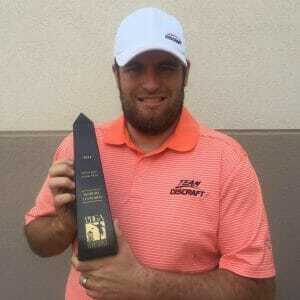 TAGGED: PDGA, Josh Anthon, PDGA, Where Are They Now? Comments on "Where Are They Now? Josh Anthon"